The Unthinkable Has Happened. Here's How We Move Forward. Yesterday I wrote about weeping as I cast my vote for the first female President of the United States of America. By the wee hours of this morning, I was weeping for a very different reason. This nation is far more divided than many of us realized. A terrifying number of people turned out to cast votes for the most unstable, bigoted candidate this country has ever seen. Anyone who voted for Trump did so knowing he is deeply racist and xenophobic, that he has repeatedly demeaned women and bragged about being sexually predatory, that he abhors free speech and encourages violence, and that he has a hair-trigger temper and an intolerance for the smallest degree of dissent. There has never been anything ambiguous about the character of Donald J. Trump. He appeals to the most dangerously weak among us, those who feel somehow disenfranchised by our nation's movement in the direction of progress, inclusion and growth. The results of this election are, as Van Jones so aptly said, "a whitelash against a changing country." So yes, if you are feeling fearful today, it is justified. But know this, too: there is no backlash in the absence of great progress. In many respects, we are here, now, precisely because our world is changing for the better. For the past eight years we have been blessed with a President whose election was unthinkable just a short time ago. We've seen the Supreme Court make marriage equality law. And in spite of this stinging loss, a new generation of girls and boys saw an election in which the most qualified candidate - the nominee of one of our two major political parties - was female. It will not be lost. Pray. Meditate. Pet your cat. Blast music. Go for a run. Do whatever thing it is that empowers you, that secures you in the certainty that yes, you are part of something greater. Something good. Something no other human being can ever take from you unless you allow it. Give thanks for the breath in your lungs, the heartbeat in your chest. You are alive. And as long as you are alive, you can effect positive change in the world. You can, and you must. Start small. Act locally. If you haven't got a moment to volunteer for a cause you believe in, simply get in the habit of treating every choice, every interaction, as an opportunity to build the world you want. Treat your relationships with care. If you have a choice between being right and being kind, choose to be kind. Speak your truth - and listen when others speak theirs. Believe in the ripple effect of loving actions. I'm not talking about the kind of fighting that's gone on at Trump rallies. Fight the good fight. Remember the words of our First Lady, Michelle Obama: When they go low, we go high. It's no good to embrace that theory unless we put it into practice in times of adversity. Look to the example of the leaders of our Civil Rights movement. Seek opportunities for nonviolent protest. Bear in mind that Trump did not win the popular vote. 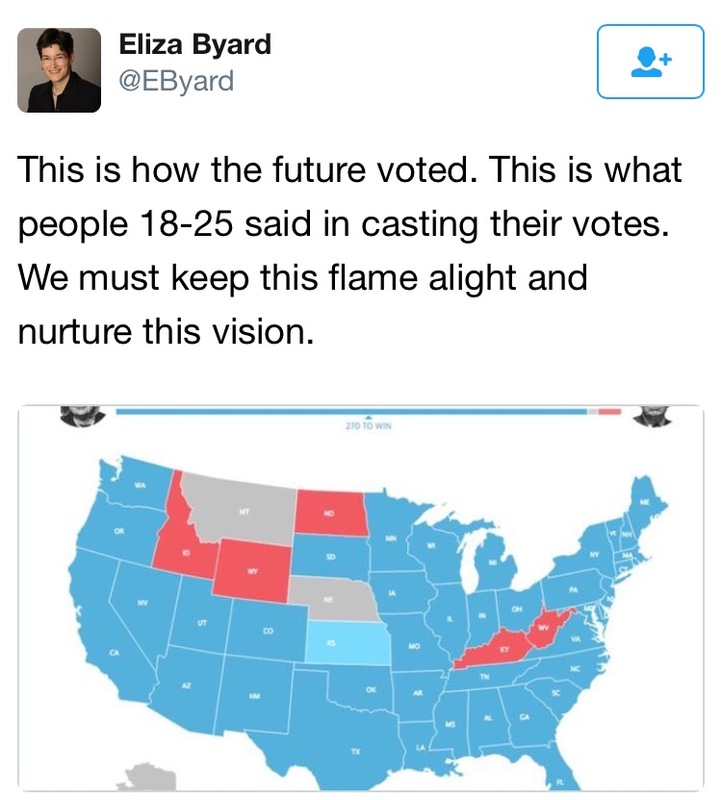 We may be stunned and disheartened by how many people turned out to vote in favor of bigotry, but no matter how staggering their numbers, we who seek progress remain in the majority - particularly in the young, voting demographic. The future, my friends, is a kind, beautiful shade of blue. The next generation understands that there is little value in the ways we divide ourselves from one another. They believe in "live and let live." They see in a positive light the very thing that stirred fearful Trump voters to action - the reality that the majority of American citizens born today are not white males. Today, it may seem bleak, but I assure you, if we remain vigilant we will become the change we wish to see.